WhitePages is the largest on-line directory of people and businesses. The company depends on a vast database that was under constant threats from attackers copying or "scraping" data. 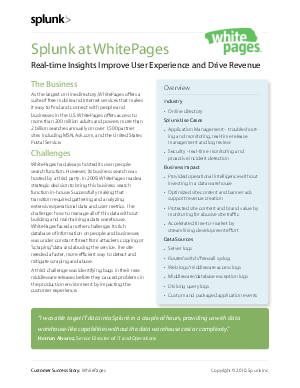 Read how Splunk enabled them to protect the site's content and the WhitePages brand by monitoring abusive site traffic and learn how Splunk's in-house search eliminated a data warehouse investment.